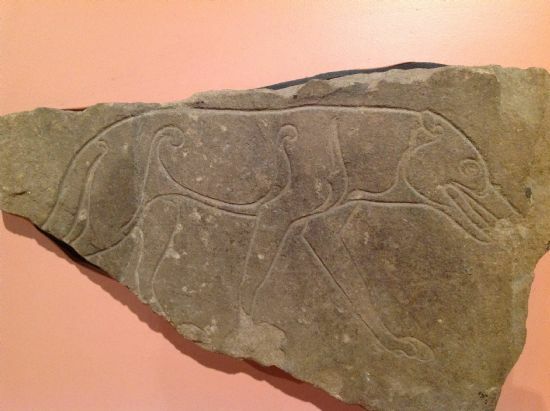 The ‘Ardross Wolf’ or ‘Wolf stone’ is a beautiful, but enigmatic, Pictish carving. It is one of three fragments of Pictish stones found in the area. This example is often thought to represent a wolf, although some argue it is a dog. Another fragment, also built into a wall at Stittenham, has the head of another animal, probably a deer. The third fragment, from Dalnavie farm, contains no animals, but a step symbol, a crescent and V-rod symbol, and a mirror and comb. At some point before 1891 this stone was found built into an ‘old wall’ at Stittenham, then on the Ardross Estate, just north of Alness. Both this stone and the deer may have been carved on the same stone that was later broken. The Ardross stones form part of a great corpus of ‘Pictish’ carved stones made up of hundreds of individual pieces. These sculptures are found throughout northern Scotland, and were traditionally dated by their style into one of three classes. The wolf stone being made up of simple incised lines on an undressed stone would fit into Class I (sculptured stones) and has been dated to the 6th century. However in recent years the class I, II & III system is increasingly being called into question and the simplistic dating looks less and less sound. While many of the facts about the Ardross wolf are unknown it does stand as testament to the skill of the person who created it, and indicate a Pictish presence in the area. Some of the Class I sculptured stones are associated with burials, suggesting that some were burial markers. The Ardross stones with animal carvings are on permanent display in Inverness Museum and Art Gallery. Carver M. 2005 Surviving in Symbols. Fraser, Iain 2008. The Pictish Symbol Stones of Scotland.